During the wash your Splendide 2100xc automatically adjusts water levels to maximize water efficiency. It draws power from a single 120-volt outlet. 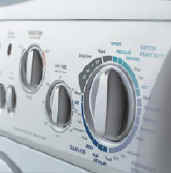 You can select from 10 wash cycles, 3 water temperatures, adjust for low spin, and extra rinse cycles. This allows you to take precise control to get the results you want while using the least amount of energy and water. The vented version is our most popular and our customers tell us that they get superior results during the drying cycle. If installing a vented unit in your RV you may have to cut a hole in the side of your vehicle and install a dryer vent. The ventless model will save you the cosmetics of an extra vent on the side of your RV and allow you to use in other places like a condo or small apartment without the need for venting. The ventless model does take 30% more time to dry a load and requires 2.5 gallons of water per hour. The Splendide 2100xc's Italian styling makes it easy on the eyes, which means if you don't have an RV or Camper, it is a smart choice in a high-end condo, or a loft where space is limited, and elegance are required. It's no wonder that every year since their introduction to the RV market in 1984, Splendide Laundry Centers have outsold all other brands in their class combined. An optional (Not included in base unit) drain a-way pan provides you with the extra assurance of having a plumbed drain pan under your unit. It includes a removable face for use under built-in machines. It is 22" square and comes ready to be plumbed.